In my continuing quest to find a decent Vinho Verde, I decided to try one called Gazela (Figure 1). I previously tried the Twin Vines 2009 Vinho Verde paired with Tofu Pad Thai. 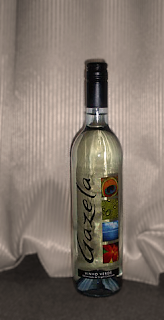 The Twin Vines is 10% alcohol, but the Gazela is only 9%. Gazela's label states that it is "a fresh, young and floral, light and smooth wine." It also says that it should be served "chilled at 6-8C, as an aperitif, with salads, fish or seafood." I would agree that this wine would pair well with fish or salads, and it was light and smooth. I also thought it was slightly sweeter than other Vinho Verde's I have tried. At $8/bottle, it is definitely good quality for the price. I also like that it has a screw cap, making it easier to recap and store in the fridge. This way I don't have to be an alcoholic and finish the bottle in one go. Final recommendations: Would recommend and will probably buy again.